Aluminum foil is widely used in automobile manufacturing, textile, electronic industry, mechanical and electrical industry, aerospace industry, packaging industry, construction industry, shipbuilding industry and so on. It is an important industrial raw material, in all of these applications, the packaging aluminum foil is the product that take use of the performance characteristics most effectively. And used for packaging material is the most seen application of aluminum foil in our daily life. The application of aluminum foil in the packaging industry mainly includes cigarette aluminum foil, aluminum foil bag, pharmaceutical aluminum foil packaging and chocolate packaging, some high-level brewers also wrap aluminum foil on the mouth of the bottle. Cigarette aluminum foil is usually double zero foil, used for liner of cigarette packaging, the main function is for moisture proof. 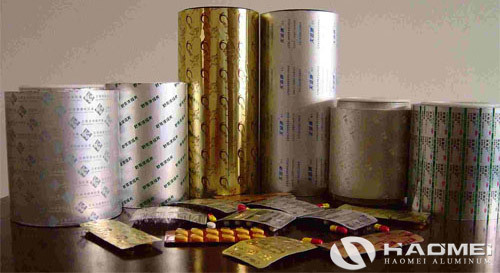 Medicine aluminum foil is the sealing material sealed on a plastic film, it has the advantages of non-toxic, corrosion resistance, heat resistance, permeability, moisture, light resistance, high temperature sterilization etc.. The thickness of medicinal aluminum foil is usually 0.02 millimeters, which is made up of protective layer, printing ink layer, base material and adhesive layer. In addition to making soft cans, aluminum foil bags are also widely used in small food and fried food. In addition, the aluminum foil bag can be packaged with drug tablets or traditional Chinese medicine powder. Because of its excellent barrier properties, aluminum foil also has a large amount of use in the packaging of ordnance and military supplies.